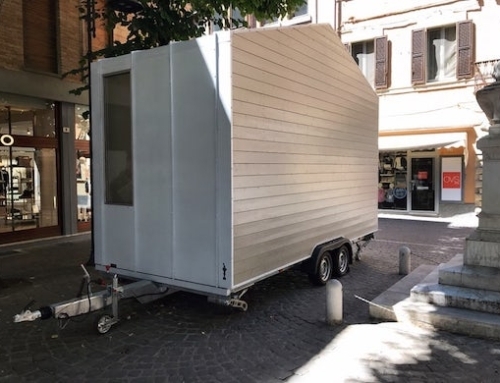 In many large cities across the world, housing is hard to come by, so more and more people are finding ingenious solutions, which allows them to live big in small spaces. 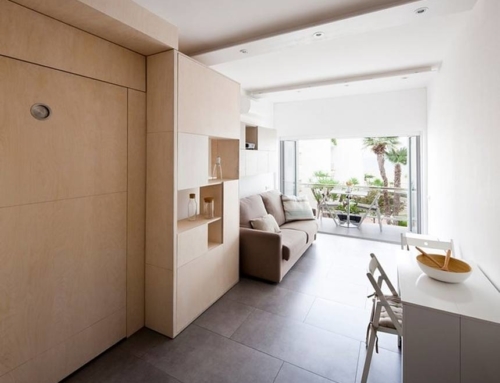 One such example is this Paris micro-apartment, which was made a lot more cozy and spacious by ingenious use of transformer furniture. The renovation was done by Batiik Studio. 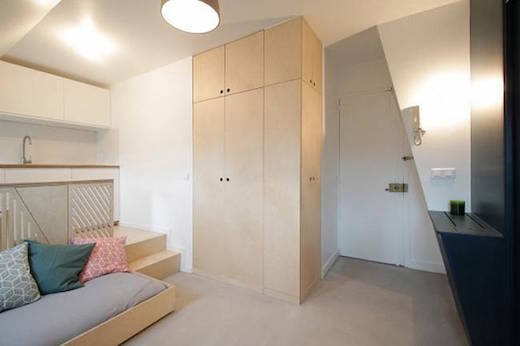 The apartment in question measures only 161 square feet (15 sq m) and was very cramped before they redesigned it. 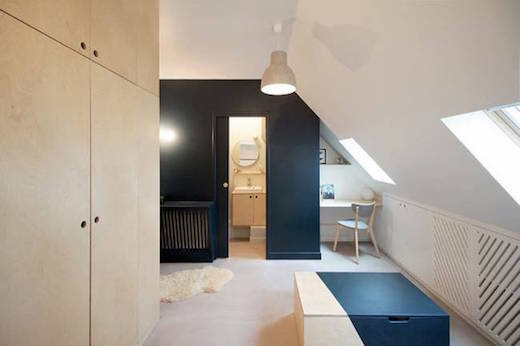 To make the most of the available area, they first installed a platform under which the bed can be stored away when not in use. This freed up most of the apartment to be used as a living area. 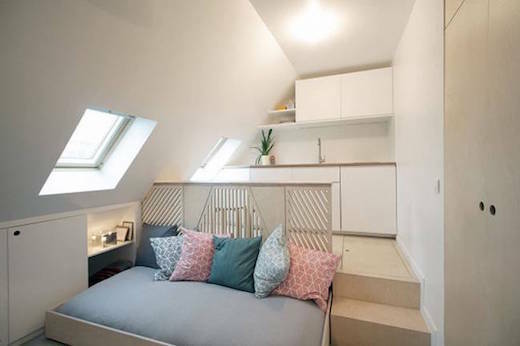 When the bed platform is pulled halfway out, it also acts as a sofa. 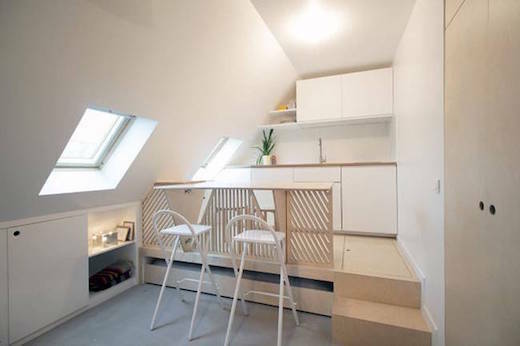 The apartment also features a small, yet functional kitchen, which is located over the bed platform. The dining counter is big enough for two to eat comfortably, and it can even be extended to create a table for four. 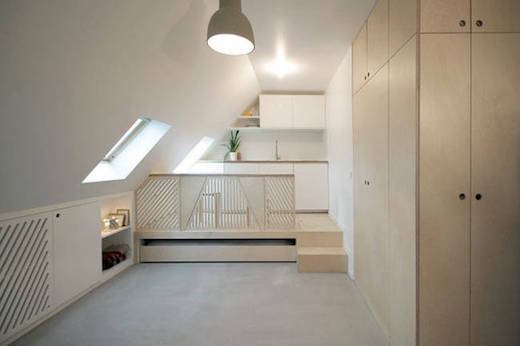 Storage is provided via a custom built, full-height closet, which is large enough to hide away all clutter. The bathroom is also quite spacious, and features a shower, toilet and sink. By moving the kitchen to the new location over the bed platform, they also gain a little nook by the window where the kitchen was originally located. This area can be used as a workspace, since it gets lots of natural light thanks to a window right next to it. 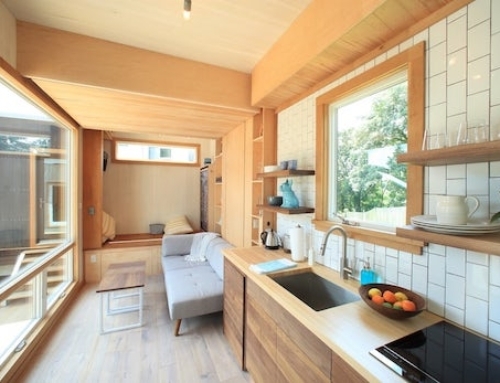 Given the micro size of this apartment, I’m surprised they were able to do this much with it, since it truly appears very spacious and cozy. A lot of this is also due to the white painted walls, and large windows, which let in plenty of natural light.